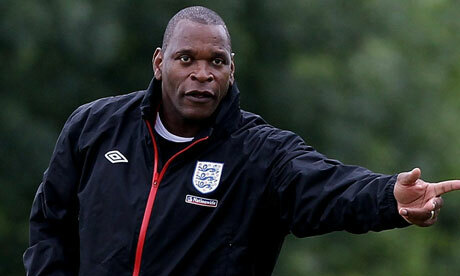 Noel Blake's side take on Montenegro, Spain and Switzerland in the European Championships this summer. England Under 19s were beaten by a single goal last night at the hands of fierce rivals, Germany. A Denis Thomalla strike gave the away side the victory in front of a sell-out crowd at Chesterfield’s B2Net stadium. Thomalla was able to pounce on a loose ball after goalkeeper Lee Nicholls pounced on the German striker’s feet. England appealed for a foul on their goalkeeper, but the referree waved away the protests and the goal stood. Germany were the ones who started strong after Lennart Thy’s low shot glanced straight across the goal. After an uneventful opening quarter, Germany struck again but were denied by the covering of James Hurst. A superb burst forward by Will Keane, who played up front just behind Connor Wickham. He presented Tom Ince with England’s first opportunity, but a curving drive was held well by Bernd Leno in the Germany goal. With ten minutes of the first half remaining, England captain Conor Coady will have felt hard done by as a moment of sheer class deserved so much better. Some majestic control, some mesmorising skill and a sumptuous volley were all factors in a wicked shot which completely beat Leno in the German goal. Unfortunately for the Liverpool youngster, the crossbar denied him a goal to remember. Just before the break it was Germany who took the lead. Thomalla’s brave finish would also turn out to be the winner. England had few chances after the break, most notably from Tom Ince testing Leno. But at the end of the day it wasn’t to be England’s night. This summer sees the European Championships for Noel Blake’s side. They kick off their campaign against Montenegro on 31st May and also have ties against Spain and Switzerland. Noel Blake’s side were definitely unlucky. In the summer I can see them beating Montenegro and Switzerland but struggling against a very strong Spain side, who I believe will be eventual winners. Although England will avoid Spain all the way to the final if qualifying along side them.